The tradition of mountain peasants in the processing of meat has passed down to the present day every little secret that the Pedranzini family jealously guards. In Alta Valle, thanks to its altitude and healthy air, they use exclusively salt and natural flavourings to age and store tasty cured meats with high nutritional value. 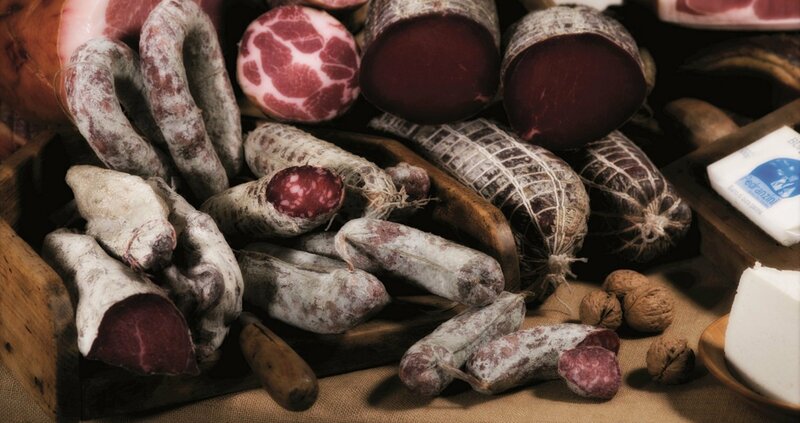 The range of local mountain Pedranzini cured meats was created based on these natural methods for preserving meat: with the excellence of Valtellina. The Prosciutto Crudo Pedranzini retains the characteristics of tradition that make it a popular, healthy product, without preservatives and colours and above all with an excellent, uniquely sweet taste on the palate. The scent released while racking indicates the genuineness and respect of the processing steps. Nutritious and especially suitable for all healthy eating regimes, naturally cured Prosciutto has fewer calories, a low cholesterol content and is highly digestible. The Prosciutto Crudo Pedranzini is produced and cured naturally in the land of Langhirano (Pr). Its low salt content complies with the limits set for Prosciutto di Parma. The fiocco della Valtellina is a prosciutto crudo made from a careful selection of the best boneless pork legs. Thanks to a traditional blend of spices and its slow curing, it acquires a delicious flavour and is decidedly... one of a kind. Our artisan tradition allows us to offer a range of simple, genuine products, with erstwhile flavours. The slinziga and cacciatori are great as an appetiser, with a nice glass of red wine, but also very practical for trips outside the city. The wurstel and sausages will make your BBQs unique! Eat well, live well! This belief forms the basis for our prosciutto crudo “IL DOLCE PALATO”, seasoned naturally using only sea salt, WITHOUT PRESERVATIVES. Careful salting and a long maturation on the Langhirano hills (home of Parma ham) give our prosciutto a sweet and delicate flavour, highly digestible, suitable for all tastes. Our horsemeat bresaola is made from the best cuts of horse legs. It is highly nutritious, rich in iron and B complex vitamins, and is also very tasty and incredibly soft on the palate. The Pedranzini speck is created in the skilful hands of a master butcher from Alto Adige. Its softness and delicate smoky flavour make it a true delicacy. The Pedranzini Beef is created by flavouring the rump tip of a beef hip, which is then cooked and smoked. An ideal product for those who love lightness without sacrificing taste.